Finally, the Thanksgiving day has come. We want to thank everyone of you for supporting us, being with us all this time – it is very important for us! We wish you happiness, joy and fortune. Now, it’s your turn to say “Thank you” to people you love. Be sure, this will make them happy! That’s not all for today, as we’ve got Black Friday sale as well! What can be better? Right, a HUGE sale! On this occasion, we’ve prepared a 20% discount for ALL our extensions! Isn’t that great? 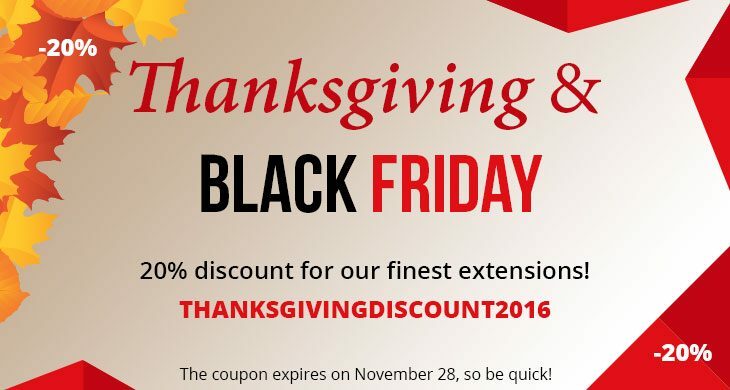 Don’t forget to use the discount code THANKSGIVINGDISCOUNT2016 on checkout! Be cautious, the coupon expires on November 28.